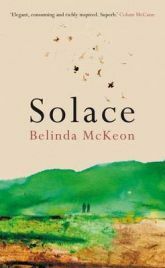 Solace by Belinda McKeon is a novel about loss and the difficulty which so many people have communicating about important issues, particularly across generations. It is set against the background of Ireland in the early part of this century, at a time when rural areas continued to cling to traditional values and ways of life while brash modern Ireland epitomised by the Dublin property boom gradually began to encroach. Mark Casey is a PhD student in Dublin, struggling with his thesis after losing enthusiasm for his work. He is writing about a Victorian novelist who lived near the small farming village where he was brought up – she once seemed important to him, but now seems irrelevant and lacking in interest. His parents, particularly his farmer father, cannot really understand what he is doing and why he doesn’t come home more regularly to help run the family farm. In reality, Mark hates the farm only a little less than he has come to dislike his academic work, and avoids going home as much as possible. In Dublin, Mark meets Joanne who comes from close to his home and whose family have ties to his own, though not good ones. Like Mark, she also has a badly damaged relationship with her parents. They quickly embark on a passionate relationship which is shattered by a tragic accident, and much of the book is concerned about how Mark deals with the aftermath of this. Solace is a novel which is beautifully written and with a strong sense of place, particularly in relation to the farming and rural scenes. Right from the beginning there is a sense that something has gone badly wrong – the book begins with a section from relatively late in the story line before flashing back to tell events from the start. It is a serious novel – the story is downbeat and there is little to lift the mood – but a rewarding one to read. The ending is an open one, so don’t expect a nicely rounded conclusion. The characters are convincing, and there are some very moving sequences. There were scenes I felt that a key revelation was about to come, a pivotal episode or phrase which would get to the core of the novelists intention, but it never quite seemed to happen. In the end I felt that this was deliberate – because failure to communicate is probably the most important theme of this novel. For instance, Joanne writes a message in a book of Mark’s, thinking that he will discover it at some future date, but he never does. And when Mark visits one of Joanne’s old lecturers there is a strong sense that something important is about to be revealed which never quite materialises. Overall then, a strong first novel which should appeal to readers of literary fiction, and a young Irish writer to watch with interest.